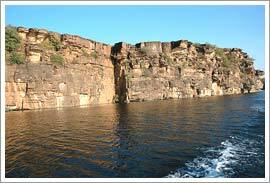 Kota is situated on the eastern bank of the Chambal river. Kota and Bundi shared common history for some years as originally both were parts of the kingdom Hadoti which was founded in the 12th century by the Hada Chieftain, Rao Deva. Years later in the 17th century, the ruler of Bundi Rao Ratan Singh separated Bundi from Kota, since then it was considered a separate and independent state. After India gained its independence, Kota got the title of a town. In Kota the industries are growing at a very fast pace making it a major industrial center of Rajasthan. It is one of the proud towns of the state as it houses the largest fertilizer plant of Asia. The town also has impressive forts, havelis and palaces. The information on Kota is incomplete without the mention of its famous Kota Doria Saris which are available in cotton and silk fabric with beautiful designs made in golden thread, and the Kota School of miniature paintings governed by the theme of hunting scenes. These paintings have minute details of the scenes they depict. Best time to flock to Kota is between October - February. In summer the temperature varies from 29.7 º C – 42.6 º C and in winter it ranges from 11.6 º C – 24.5 º C.
You can reach Kota from the nearest Jaipur airport which is 250 km away from Kota. The town is well connected with the major cities of Rajasthan through a wide network of roads. Railway connects Kota with major cities like Mumbai, Delhi, Agra, and Jaipur.